From the leather coats and sunglasses of The Matrix to the faded blue coveralls of Nineteen Eighty-Four, one of the characteristics of the imagined future is a break from gendered clothing, which is replaced by something more functional and utilitarian. It’s a world of zippered jumpsuits, where a corset or tie is as exotic an artifact as a fossil from the Pleistocene Era. Gender, these futurists seem to be saying, is an artifact of a less-progressive past. But is the future now? Then there was Target’s announcement in August that the retail giant would be eliminating gendered language in its children’s toys and bedding, transgender celebrity Caitlyn Jenner’s Vanity Fair cover and singer Miley Cyrus’ self-identification as gender-fluid. But before we raise a toast to a world of post-gender fashion, it’s important to differentiate between marketing and actual progress towards gender equality. To be sure, fashion can advocate for social change. But just as often, fashion will exploit social movements, aestheticizing them as a way to seem edgy and turn a profit. To understand what fashion means, we have to place it into its historical context. Likewise, we can’t understand clothes outside of the society that gives them meaning – or apart from the industry that makes and markets them. In my research, I’ve studied how subcultures in the United States have used clothing to create communities that are critical of mainstream values. And there’s a long history of gender lines being blurred in clothing as a way to demonstrate equality of the sexes or freedom from sexual roles. Founded in 1824, the New Harmony socialist utopian community let men and women both wear trousers. It was borderline-scandalous for the era, but representative of their vision of gender equality. 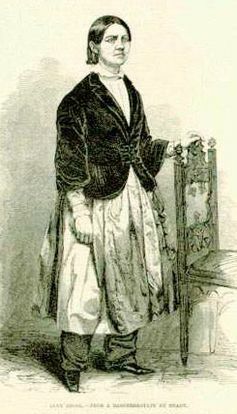 In the late 19th century, women’s rights advocate Amelia Bloomer famously argued for the right of women to wear pants – called bloomers – under their shortened dresses. In less political subtexts, like the counterculture of the 1960s, unisex styles differentiated hippies from middle-class society. While this allowed hippies to recognize one another as people with similar values, looking different could also be dangerous. During filming for the countercultural road movie Easy Rider in parts of the South, actors Peter Fonda and Dennis Hopper discovered that men who grew their hair long were often asked whether they were a boy or a girl – and not in a friendly way. These real-life experiences were incorporated into the film’s violent ending. When hip-hop became a nationwide cultural phenomenon in the 1980s, male and female breakdancers – also known as b-boys and b-girls – wore tracksuits and other athletic clothing while they performed, blurring gender roles for a shared physical ability. On the other hand, when the fashion industry promotes unisex styles – like the Peacock Revolution of the late 1960s or the groovy styles of the 1970s – it’s always tied to making money. So while today’s unisex fashions may seem like another benchmark for equality, it’s rarely progressive when you look at it through the lens of a lucrative fashion industry that’s looking to turn a profit. African Americans have long been used by the fashion industry in this way. Posing Brazilian model Gisele Bundchen in the arms of screaming basketball player LeBron James on the cover of Vogue in 2008 was a not-so-subtle echo of racist images that depicted vulnerable white women threatened by animalistic black men. In the case of Taylor Swift’s colonial fantasy video for Wildest Dreams, blacks are entirely absent from its African locale. And fashion magazines have been known to “black up” white models rather than hire black ones. Jaden Smith in the new SS16 Louis Vuitton ad Campaign photographed by Bruce Weber. In all of these instances, racial differences, poverty and violence are repackaged as “exotic.” Aestheticized to appeal to our eyes, they create a clear distinction: there is us (the mainstream consumers) and them (the outsiders we are fascinated, disgusted or thrilled by). The fashion industry’s current attraction to unisex or gender-free clothing may be similar. While transgender models like Andreja Pejic and Hari Nef walk the runway and appear in fashion magazines, the real difficulties facing transgender individuals are often ignored. This is doubly true for transgender women of color who are the victims of shocking amounts of violence. Given the fashion industry’s historically poor record of including African Americans as models or designers (outside of the urban fashion niche), it’s unlikely that it will be any more progressive when it comes to portraying the reality of the lives of transgender people of color – or in employing them behind the scenes. But before we congratulate the fashion industry for making gender distinction a thing of the past, it’s important to understand its motivations, its practices and its limitations. Mary Rizzo is Assistant Professor of Professional Practice and Associate Director of Public and Digital Humanities Initiatives, Rutgers University Newark. This article was originally published on The Conversation. Read the original piece through this link.